A twitch north to Scotland, South Yorkshire moorland birding magic and this time, a genuine white-winger. The (American) White-winged Scoter is a relatively new addition to the British list (2013) following the first off the Aberdeenshire coast in 2011. This North American cousin of the Velvet Scoter has appeared a handful of times in Scotland since and debate continues as to how many different birds have actually been seen. An adult drake of this species on the Firth of Forth offshore from Musselburgh, Edinburgh present before Easter - would it linger to be twitched? A 5 hours drive (29 Mar) from South Yorkshire to Edinburgh had the delights of the morning rush hour traffic around Newcastle to contend with, where the fog on the Tyne lingered. The coastal run into the borders was pretty spectacular and relatively traffic free. Arrived on site (10:30) to news that the very rare Scoter had been present earlier but then flew west towards the harbour. 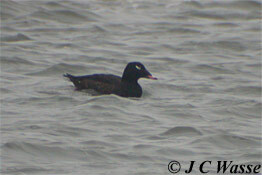 The Firth held small scattered groups of Velvet Scoters with Eider and Goldeneye also present. A handful of Long-tailed Ducks were busy moving from one side of the Esk river mouth to the other. All of these seaducks and the rare drake Surf Scoter offshore would have usually warranted much more prolonged and closer scrutiny, but where was the very rare Scoter? I scanned the sea and to the west soon picked up a drake 'Velvet' Scoter type with a pronounced white eye tick patch swimming with a group of 4 definite 'Velvets'. One of the locals had seen the same bird and there it was, the adult drake (American) White-winged Scoter. Spent the next couple of hours studying this bird as it kept company with Velvet Scoters at a reasonable distance offshore, at one stage flying strongly east before doing a U-turn. It was never close for photos but gave comfortable 'scope views on a not so choppy Firth under good light. On several occasions it's North American Surf Scoter pal was in the same field of view. Of the (American) White-winged Scoter as well as the eye tick, the bill had less of a pale patch which was pinkish in colour and not yellow as for Velvet Scoter, and the bill shape differed with a bit of a bulge at the base of the upper mandible. This was difficult to make out, but noticeable at some angles. I'm sure the brownish flanks were evident during some wing flaps... to a degree! On now making time to study the other seaducks I manage to pick out 3 Slavonian Grebes moulting into summer plumage. This made them difficult to pick out against the dark water as they just seemed to melt away! Several Red-throated Divers and Guillemots present offshore. At the river mouth flocks of Oystercatchers, Curlews and Bar-tailed Godwits flew by, moving from roosting to feeding sites. 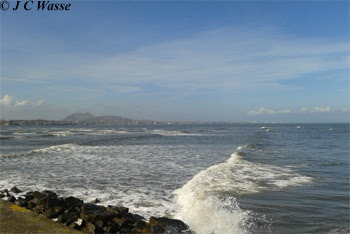 A photo looking west to Edinburgh from the Esk river mouth at Musselburgh on the day, whereas the (American) White-winged Scoter shown below was photographed several years before in Washington State, USA (2008). Home in South Yorkshire where the diverse landscape makes for brilliant birding. However, the varied weather always has a part to play in the birding day. This trip included sunny days where it was quite mild in sheltered spots, with April showers featuring shortly after Easter. 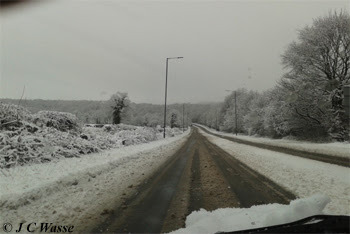 However, Easter Monday (02 Apr) saw a deluge of snow for 3 hours in the morning catching many road users unaware around Sheffield and on the cross Peninne approaches. Visited Old Moor RSPB during the afternoon thaw on Easter Monday. One adult Mediterranean Gull present on the mere in its summer finery, and the Swallow hawking insects over the water looked out of place against the snowy and now misty backdrop. A Bittern 'boomed' from the reedbeds. The South Yorkshire moorlands were magical. 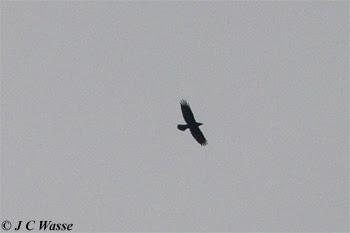 Buzzards and Kestrels patrolled the skies with a couple of Ravens noted. Curlews dominated the rough ground and chipping Snipe were a delight. Oystercatchers also back on territory, likewise a pair of displaying Golden Plovers. 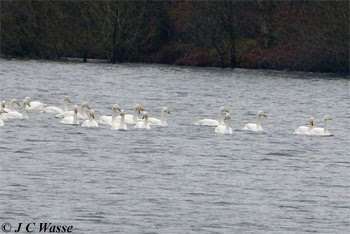 A flock of over 250 'Goldies' at a staging site nearby were preparing for more northern climes. A small flock of 9 Common Crossbills 'jipping' in flight as they moved from one moorland plantation to another (03 Apr). A migrant Red Kite was upstaged by a passage Osprey that moved north up the Strines valley at lunchtime the same day (03 Apr), with another Osprey flying north in the same area the following morning (04 Apr). This second bird was tracking the moorland edge to the west. Always nice to see these beautiful fish eating raptors, especially on migration. As well as their distinctive plumage, the hanging nature of the slow long circles they make in the sky are pretty characteristic as is when they change tact, launching themselves into a long fast power glides maintaing a distinctive shallow M-wing profile. Moreover, study a migrating Osprey and see how little they flap. It's very much a case of gliding and flapping only when they have to. A few days beforehand (31 Mar) I was driving along the moorland edge along Mortimer Road mid afternoon where a group of big white 'blobs' were close inshore at Strines Reservoir. 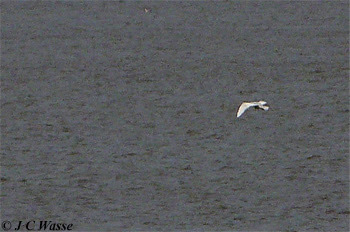 Mindful of passage Whooper Swans being noted in the region, I stopped to have a further look. Good job I did as the 'blobs' turned out to be a vocal flock of about 60 Whooper Swans (57 or 58 with 10 - 20% being immatures). After the event I understood they were seen earlier in the day over Sheffield and then departed either the same evening, or overnight? Back at Rainham Marshes RSPB, London (07 Apr) where the sunny morning skies gave way to increasing cloud on a mild and brisk southerly wind. The weather promised visible migration but it was not to be. The reserve held a variety of birdlife including very vocal Redshanks back on territory, noisy Cetti's Warblers, several winter ducks remaining and stunning Marsh Harriers patrolling the site. Less expected yet most welcome was an immature (1st summer type) Iceland Gull. It stuck out like a sore thumb as it joined Herring Gulls picking at the surface of the Thames on the edge of Aveley Bay, as it 'glowed' in the morning sunshine. From here a scan from the river wall back onto the reserve produced a sighting of a Great White Egret (cannot get used to the Great Egret name!) that had been in residence for a week or so. For such a large species it could be difficult to pick up in Rainham's marshland habitat, and only gave itself up at 1/2 mile range as it fed apart from the several Little Egrets gracing the reserve. Later on from the balcony a Peregrine provided entertainment as it made sure another flew off up river. More photos from this period at 'Latest UK Bird Photos'.